Run your tests in arbitrarily big thread pools with various policies available (all methods in their own thread, one thread per test class, etc...). Supported by a variety of tools and plug-ins (Eclipse, IDEA, Maven, etc...). Embeds BeanShell for further flexibility. Default JDK functions for runtime and logging (no dependencies). 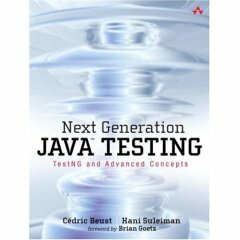 I started TestNG out of frustration for some JUnit deficiencies which I have documented on my weblog here and here Reading these entries might give you a better idea of the goal I am trying to achieve with TestNG. You can also check out a quick overview of the main features and an article describing a very concrete example where the combined use of several TestNG's features provides for a very intuitive and maintainable testing design. The method setUp() will be invoked after the test class has been built and before any test method is run. In this example, we will be running the group fast, so aFastTest() will be invoked while aSlowTest() will be skipped.